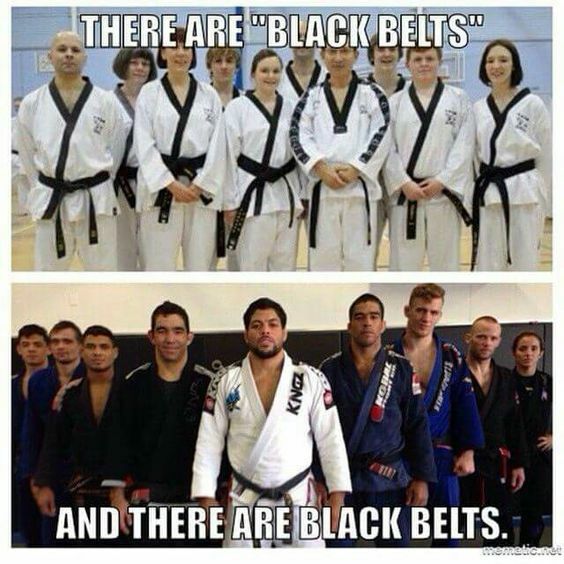 A friend of a friend (both guys are longtime Isshinryu karate practitioners) is a part-owner of a successful Brazilian jiu-jitsu (BJJ) school in the Hamptons of Long Island, NY. I went to his dojo years ago when he was still doing karate; he was fairly new to BJJ and showed some impressive on-the-ground techniques (his uke [attacker] was 6'8, 300 + pounds). At the time I was dabbling in aikido and tai chi, so the rough and tumble techniques of BJJ were refreshing, so to speak. I had no interest in regular BJJ training, but I respected its apparent effectiveness. My friend's friend has since developed some early onset arthritic joints (he's in his early 30s) from the habitual grabbing of other players' gi (judo jacket), armbars, and the like. His fingers in particular are messed up and will likely worsen, but no cauliflower ears so far. Karate: the vast majority of what is called Karate today is about as effective as interpretive dance. Wide stances, complete lack of takedown defense or awareness of submissions and a general watering down of its belt systems have made Karate kind of hilarious. There are some styles that have proven to be effective, so never assume that someone who does Karate is ineffective, but generalizations can be made. Taekwondo: perhaps the most popular and most derided Asian martial art, TKD has become a sort of a joke in that it is, on a fundamental level, simply tag played with ones feet. Brazilian Jiu Jitsu is superior to Taekwondo because, simply put there is no distance management taught in most standard Taekwondo curriculums making it, on a fundamental level, ineffective…especially when someone that know what they are doing grabs you. Taekwondo may have surpassed judo as the most popular style on the planet, thanks in part to its inclusion in the Olympics (like judo), but also (unlike judo) for its reputation for quick promotion and prepubescent black belts, resulting in its new moniker "take-one's-dough." In fairness, we have karate "McDojos" doing similar things for the almighty buck. To reiterate, the BJJ guy is raking it in. It's all in the marketing.